Danish structural engineer Povl Ahm worked on some extraordinary projects in his lifetime. After joining the London office of Ove Arup & Partners in 1952, he collaborated on Coventry Cathedral with Basil Spence and St Catherine’s College in Oxford with his countryman Arne Jacobsen; later the pair worked together again on the Danish Embassy in London. One of Ahm’s greatest, though lesser known, achievements is his own house in Harpenden, Hertfordshire, which has won a Wallpaper* Design Award for Best Remastered. 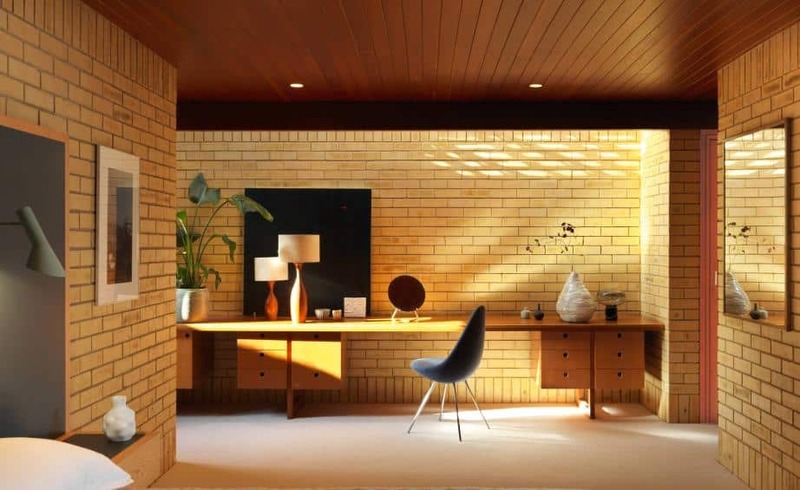 Ahm built an exceptional home designed by Danish architect Jørn Utzon, whom he got to know during the early design stages of Utzon’s Sydney Opera House, which also involved Ove Arup & Partners. Ahm asked Utzon to design a house in England and the architect obliged, sending his plans over in the early 1960s for his friend to work with. The original Ahm House – Utzon’s only completed project in the UK – was gently pushed widthways into the modestly sloping suburban site. From the street, the house is enigmatic, with the garage and entrance forming a buffer between the public and private realm. But as you step inside the entrance hall and ascend a series of steps, Ahm’s pavilion dramatically unfolds. This linear lodge of brick, concrete and glass turns its back upon the neighbours to one side but opens itself dramatically to the rear gardens. The relationship between the living spaces and adjoining terraces is reminiscent, along with the materials, of Utzon’s own family house near Helsingør in Denmark, which the architect completed in two phases during the 1950s. The highlight of the Ahm House – which reveals itself as you step around the central brick hearth and chimney breast – is the generous sitting room. Here, floor-to-ceiling banks of glass connect with the gardens and throw natural light on the brickwork, the tiled floors and the coffered ceiling, which combines concrete beams with strips of pine. ‘We loved the character of the materials as soon as we saw the house,’ says its new owner, who shares it with her husband and their young child. ‘For us it was also about the connections to the greenery and the trees. 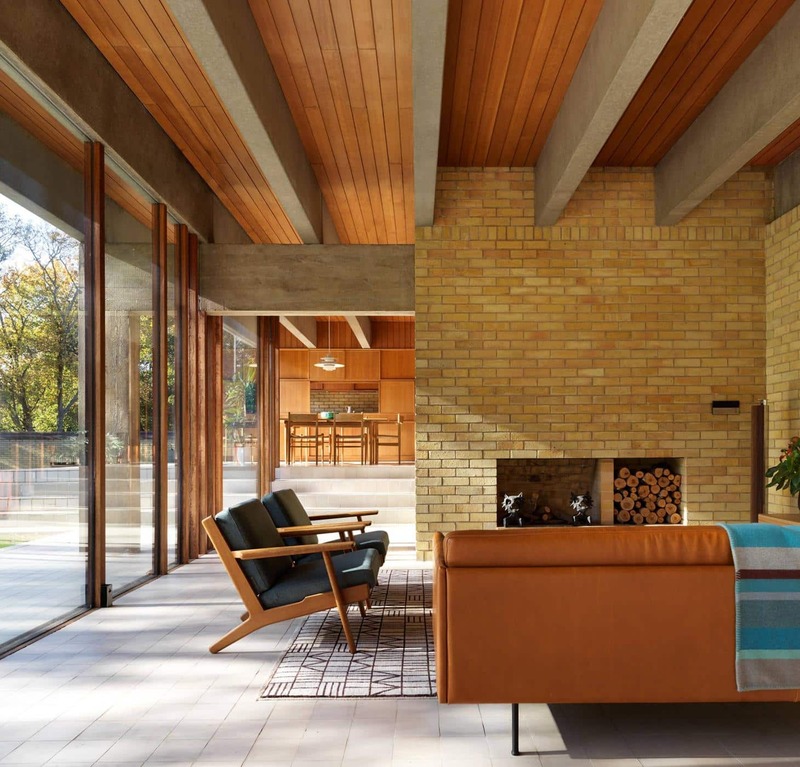 It does feel like a secret garden.’ Having acquired the house and immersed themselves in Utzon’s history, the owners approached architecture and design studio Coppin Dockray to work on the interiors and a super-sensitive restoration. 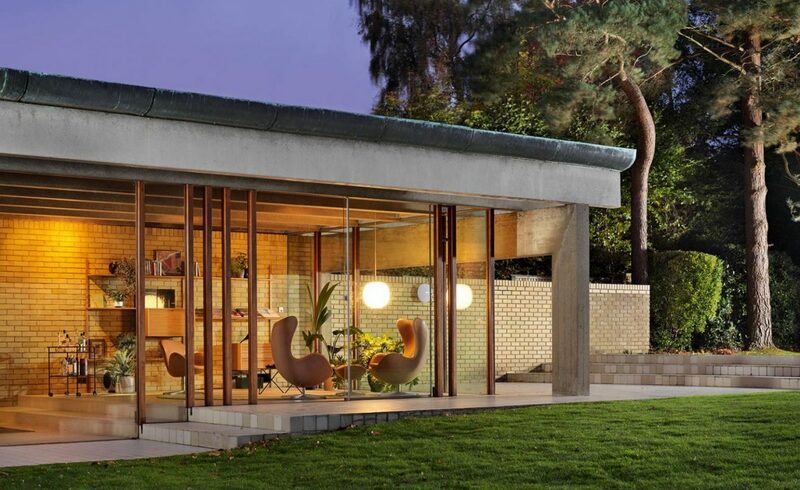 Founders Sandra Coppin and Bev Dockray have experience of heritage commissions such as apartments in Berthold Lubetkin’s 1938 Highpoint buildings in London, and a 1960s house in Wiltshire, designed by architect David Levitt for another Arup partner. The Danish theme continues into the dining area and kitchen, where the table and chairs are by Hans Wegner. The kitchen itself is largely original, with Coppin Dockray having taken the gentlest of touches to lighting updates and occasional restoration. The same is true of the spaces beyond, including the sequence of four original bedrooms, where any missing joinery was carefully reinstated. Coppin Dockray also worked, in a similar vein, on the wing that Ahm added in the 1970s to a sympathetic design by Ulrik Plesner. Creating an L-shaped formation, orientated towards the garden, Ahm built this part of the house for his two teenage sons. It now houses the master bedroom and bathroom, complete with a sauna, and a dressing room. An underground link between the two portions of the house, added by the previous owners (the house was sold by Ahm’s widow a few years after his death in 2005), has been redesigned as a playroom and a library.